- Right click on the highlighted recipe. - Choose the option PRINT. - Change the Pages/Print from ALL to SELECTION. - Press the PRINT button. Mix all above ingredients. Spread half of mixture in bottom of 9 x 13 inch pan. Combine last 3 ingredients; spread over dough. Dot filling with remaining dough. Bake at 325 degrees for 45 minutes. Cut while warm. 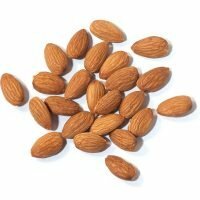 Place almonds and chocolate into blender or food chopper. Process just until almonds are finely chopped. In medium bowl, cream butter with sugar, beat in flour, salt, almond extract, egg and all but 1/3 cup of the almond-chocolate mixture. Shape dough into 1 inch balls. Roll in remaining chocolate mixture. Bake on an ungreased cookie sheet at 350 degrees for 15-20 minutes. Cool. Store in an airtight container or freezer. In a pot over medium heat, cook the green beans and tomatoes until heated through. Season with Italian seasoning. Stir in the almonds just before serving. Mix together well eggs and cream cheese. Add sugar and extract. Beat until smooth. Pour into greased 9 inch pan. Bake at 350 degrees for 30 minutes. Cool 10 minutes. Combine topping ingredients. Spread on cheesecake. Bake 10 minutes more. Serve chilled with fruit on top. Serves 8 to 10. In a 10- to 12-inch frying pan over medium-high heat, melt butter. When butter foams, add almonds and stir until nuts begin to brown. Remove nuts from heat and stir in lemon juice. Serve immediately over baked or steamed fish. Preheat oven to 350' grease or paper line two 12 cup muffin tins - combine flour-sugar-baking powder-salt in bowl; mean while whisk oil-milk-eggs-extract in another bowl till smooth Add the dry ingredients mixing till moist - Very gently stir in all the poppy seeds. Fill muffin tins, and bake for approximately 30 minutes. Serve warm or cold - Made these last summer and they were very moist and very flavorful. PREHEAT OVEN TO 400F. Beat egg, salt and sugar until light and fluffy. Add oil in a stream and continue beating. Beat in milk. Sift flour and baking powder together several times and add to batter, stirring until just mixed. Add nuts and poppy seeds. Bake in greased muffin tins for 20-25 minutes. All dry ingredients should be sifted. Therefore, start by sifting together powdered sugar and cake flour. Add salt. In a large dry bowl whisk egg whites until soft peaks form. Add cream of tartar at the end. Gradually add granulated sugar to egg whites, whisking all the time. Sift 1/3 of flour mixture over egg whites,lightly fold in. Repeat with remaining flour mixture, little by little. Turn batter into a large ungreased tube pan. Smooth top. Bake at 350. for about 40 minutes or till cake is done. Cool cake. Loosen around edges, remove cake from pan. Make butter cream by beating butter until very soft and smooth. Add coffee, cocoa, and powdered sugar. Beat until very light. Spread mixture in between layers and around cake. Garnish with chocolate sprinkles.